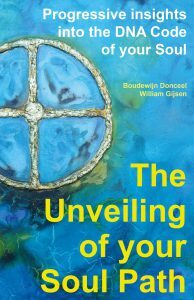 The unveiling of your Soul Path – Progressive insights into the DNA Code of your Soul. The increasing hectic nature in the world surrounding us makes us more than ever ponder on fundamental questions. What is the meaning of existence? Who am I really? What do I truly want? The answers to those questions are obvious when you take your Soul as a starting-point. This book is the manual for discovering your Soul Path. 15 years of experience on the subject have been summarized into one global statement. It can be seen as the Bible of the New Age. Insightful, fascinating, inspiring, confronting, but above all revealing!